Today, the Congress Commemorative Gold Five-Dollar Coin remembers when they voted on February 12, 1850 to purchase the original manuscript of Washington’s Farewell Address to the people. Resolved by the Senate and House of Representatives of the United States of America in Congress assembled, That the joint committee on the library be authorized to purchase teh manuscript of the Farewell Address to the people of the United States, of George Washington, if the purchase of it can be effected on fair and just terms, in the opinion of the committee. The Congressional Globe published on January 29, 1850 included the discussion of January 24 regarding the purchase of Washington’s Farewell Address. Mr. President, I intended that the resolution should be a joint one, and I believe the Secretary has given it that form at my instance. Sir, I did not wish to trouble the Senate in presenting this resolution. I was anxious to accomplish the object it proposes without the formality of the passage of a resolution by Congress, and I addressed myself to the Joint Committee on the Library in consequence of a wish to avoid the passage of any resolution. The committee took the subject into their consideration, and came to the conclusion that, as they had never heretofore applied the funds entrusted to them to the purchase of manuscripts without the sanction of Congress, they could not venture on any expenditure for the purchasing of this manuscript without some other authority than that which they now possessed. This reply led me to the presentation of this resolution. If the object which it contemplates could have been accomplished without presenting it here, I would not have taken up one moment of the precious time of the Senate. I will now state some of the motives which led me to the presentation of this resolution. It is about fifty-three years ago since General Washington, the Father of his Country, by universal consent, addressed to the people of the United States the document described in that resolution. At the time of the preparation of it there was paper, which those who are conversant with the history of the country at the time will recollect was published at Philadelphia by an extremely respectable and intelligent gentleman, Mr. Claypoole, called the Daily Advertiser. Gen. Washington selected that paper for the publication of his Farewell Address; and, after it was committed to print, Mr. Claypoole proposed to return the original document to General Washington, and waited upon him for that purpose; but being extremely desirous to possess it, he expressed his wish that, if the General did not wish it himself, he would like to retain it as a memorial. General Washington assented to the request; and the paper from that day to this has been in the hands either of Mr. Claypoole or some of his descendants. Well, sir, when l read that advertisement, I said to myself, what is to become of that precious document? Is it to be sold, to be perhaps transferred out of the country, and made the ornament of the parlor of some of the distinguished men of Europe —men of rank or title or literary fame—or shall it remain here? Mr. President, man is not an abstraction. He is a being possessing feelings, sensations, and sympathies; and allow me to say too, sir, that, although we may derive great pleasure from tracing the narratives of the glory of our ancestors and the deeds of the men of celebrity in our own country, yet some physical memorial of them, some tangible, palpable object, always addresses itself to our hearts and to our feelings. Sir, is there a son living who, on the death of his father, will not look with pride and satisfaction upon the objects which were dear to that father during his lifetime—upon the cane which sustained his tottering steps in the latter period of his life, upon the watch which he wore, upon the horse on which he rode, upon the saddle on which he sat, upon the cup from which his thirst was quenched? And, sir, is there an American son of Washington, as we all are, who cannot and who will not always look with pleasure and satisfaction upon the objects with which his name was connected? Sir, in my own humble parlor at Ashland, I have at this moment a broken goblet which was used by General Washington, during almost the whole of the revolutionary war. It was in his camp, confided to me by an old lady of some eighty years of age; and there is nothing in that parlor so much revered, or which is an object of greater admiration to the stranger who comes to see me. This feeling of attachment to these objects, associated with the memory of those whom we venerate, and whom we loved during their lifetime, is not merely a private feeling of attachment; it is a broader, more comprehensive, and national feeling. Do we not all recollect how the hearts of all France thrilled with joy when she learned that the remains of Napoleon were to be transported from the island of St. Helena back to that country upon which he had shed so much glory? Do we not all recollect with what sensations of indignation England heard the proposition to transport the remains of the humble dwelling—and it was humble indeed—in which Shakespeare had his birth? And how indignant did we not all feel when the report— though fortunately it turned out not to be true— reached us that some desperate robber had violated the grave of Washington himself, for the purpose of transporting his remains to a distant land? Sir, these are feelings which are worthy of being countenanced and cherished by public authority. To say nothing of the nature and character of that address, who is there, sir, amidst the discordant and ungrateful sounds of disunion and discord which assail our ears in every part of this country, and in both halls of Congress—who is there that would not find refreshment and delight behind the Farewell Address of Washington to the people of this country? Who is there that would not trace the paternal and patriotic advice with pleasure which was written by his own hand—that hand which, after having grasped the sword that achieved the liberties of our country, traced with the instrument of peace the document which then gave us that advice, so necessary to preserve and transmit to posterity the treasure he had bestowed upon us? Who is there, in tracing that advice to beware of sectional divisions, to beware of demagogues, to beware of the consequences of the indulgence of a spirit of disunion—who is there, in reading those lines of truly parental advice, that will not in imagination transport himself back to the period when they were transmitted to paper by Washington, and think of the emotions, the parental and patriotic emotions, at that precious moment, which must have animated his breast? I have said more, much more, than was necessary to secure the object I had in view—the adoption of this resolution, which is to give to the Joint Committee on the Library the authority to purchase this document. I have specified no price. It was not necessary to bargain for the document, lest advantage might be taken. I have left it to the discretion of the committee, in which, I trust, we can all confide. I hope it will meet with the unanimous concurrence of the Senate. 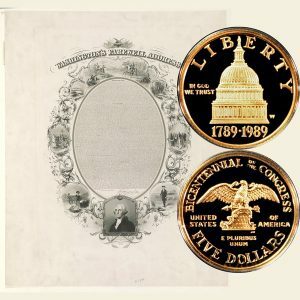 The Congress Commemorative Gold Five-Dollar Coin shows with an image of Washington’s Farewell Address as it was produced for a keepsake, circa 1856.